Father Dave Pivonka, TOR, processed the Blessed Sacrament through the crowds of SteubySTL Week 1 on Saturday night, blessing section by section. Father Pivonka was one of the hosts of Steubenville STL Mid-America, hosted annually by the archdiocese in Springfield, Mo. Jon Halfmann jokes this was his second Steubenville conference. The 14-year-old from St. Joseph in Imperial has heard about the event since birth, as his parents have regularly chaperoned and volunteered at the conferences since the archdiocese began hosting them in 1999. The Halfmann family met Fr. Dave Pivonka, who announced their son John's birth at SteubySTL 14 years ago. Steubenville STL Mid-America is a two-weekend event hosted annually by the archdiocese in Springfield, Mo. 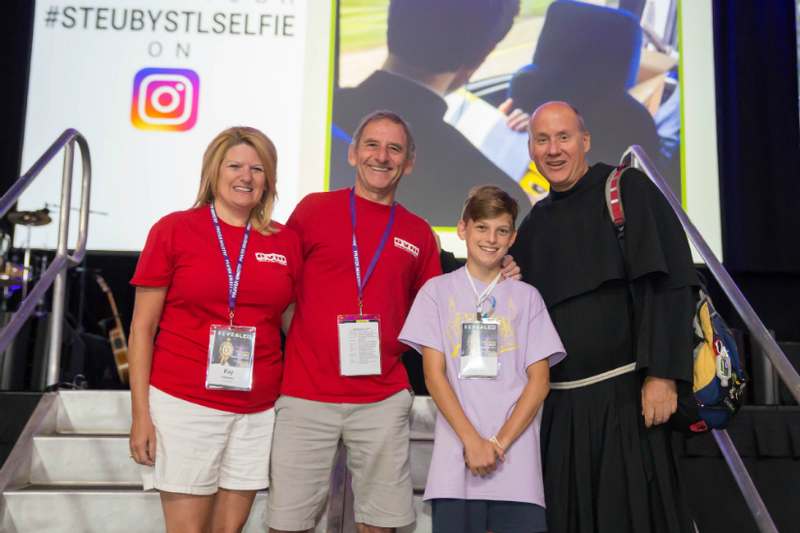 The archdiocesan Office of Youth Ministry (OYM) organizes two Steubenville STL Mid-America events, affectionately known as SteubySTL, annually in July. The three-day conferences help people, mostly high-schoolers, grow in faith through talks, music and the sacraments. This may have been Jon's first conference as a participant, but he also counts the one during which he was born. Both of his parents were attending the conference in 2004: his mother, Kay Halfmann, as a volunteer and father, Paul Halfmann, as a chaperone. Kay was seven-and-a-half months pregnant and cleared by her doctor to attend. She got rear-ended on her drive down, but was again cleared by her doctor. Early Sunday morning of that conference, she awoke to find she was going into labor due to her car accident. Friends found Paul and rushed Kay to the hospital, where Jon was born that morning. Word reached the conference, and Father Dave Pivonka, TOR, the host priest, made the birth announcement from the stage, calling it a first in Steubenville history. Father Pivonka also hosted this year's conference, his first time back at SteubySTL since that year. Despite the high-stakes circumstances surrounding Jon's birth, "we could handle it" since the family had five children already, Paul said. For his first few years, Jon was called "Baby Steuby." Steubenville gatherings are held throughout the country every summer. The archdiocese has held the event in Springfield since 2002. A record 4,803, plus a staff of 161, attended the first week this year. "The conferences present an opportunity of encounter where a teenager can encounter Christ and His Church in a way that they might not see at their home parish week-to-week," said Amy Eschelbach, associate director of the archdiocesan Office of Youth Ministry, who oversaw much of the preparation. The conference began Friday night as crowds pressed against the gate of the JQH Arena at Missouri State University. "We wanna see Jesus!" shouted Grace Schlueter from Immaculate Conception Parish in Dardenne Prairie. At moments throughout the weekend, the arena shook with cheers and stomping feet. At others, the crowd of thousands fell utterly and prayerfully silent. "The experience of praying and worshiping with literally thousands of other Catholics who actually care about their faith in a world that tells you that they don't exist is incredible," said fifth-year attendee Andrew Leingang from Queen of All Saints Parish in south St. Louis County. "It really showed me what it means to be joyful," he reflected as cries of "olé" echoed outside the arena. 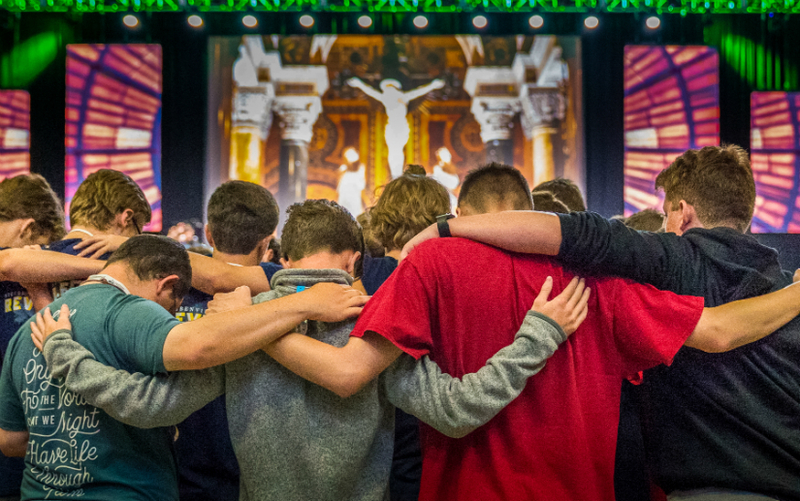 Young men considering a call to the priesthood stood with arms around each other during the annual Steubenville “vocations call” at the close of SteubySTL Week 1. Steubenville STL Mid-America is a two-weekend event hosted annually by the archdiocese in Springfield, Mo. Jimmy Mitchell of Nashville, Tenn., delivered the Friday night keynote before adoration. Worship leader Kyle Huelsing, music director at at St. Joseph Parish in Cottleville and St. Clement of Rome Parish in Des Peres, led the crowd in preparation for Eucharistic adoration. Where earlier his band's praise and worship music was exuberant and loud, they now transitioned to a contemplative tone. The stands groaned as the crowd knelt and Bishop Rivituso entered with the Blessed Sacrament under a spotlight. "It's just a beautiful thing that everyone can calm like that," said Abigail Rose of Assumption Parish. "What was hard for me to wrap my brain around was how God loves us so much even though we reject Him so many times," said Jon Halfmann. The Halfmanns weren't the only ones with a family connection to this conference: celebrating Mass on Saturday and Sunday was Archbishop Peter Wells, papal nuncio to South Africa, who attended at the invitation of his nieces Tori and Lydia Wells from Guthrie, Okla. Tori had come to SteubySTL previously, after which she asked her uncle, "Do you think you can come and be with us next time?" Third time's a charm, as this is Tori's third year. Tori Wells came back because "it's fun seeing so many people that are Catholic as well, because there's not a lot of Catholics in the area (where) we live" in Oklahoma, she said. The archbishop said the event had a "eucharistic center," particularly at adoration under spotlights. "The tradition that we have, the liturgical form that we have, and then to see that mingled with contemporary expression, there are very few religions that can do that," he said. "That is the genius of Catholicism: we are always culturally relevant." Mass on Saturday set the tone for a day of breakout sessions, confession and adoration. The Office of Youth Ministry counted around 2,400 confessions by Sunday morning. 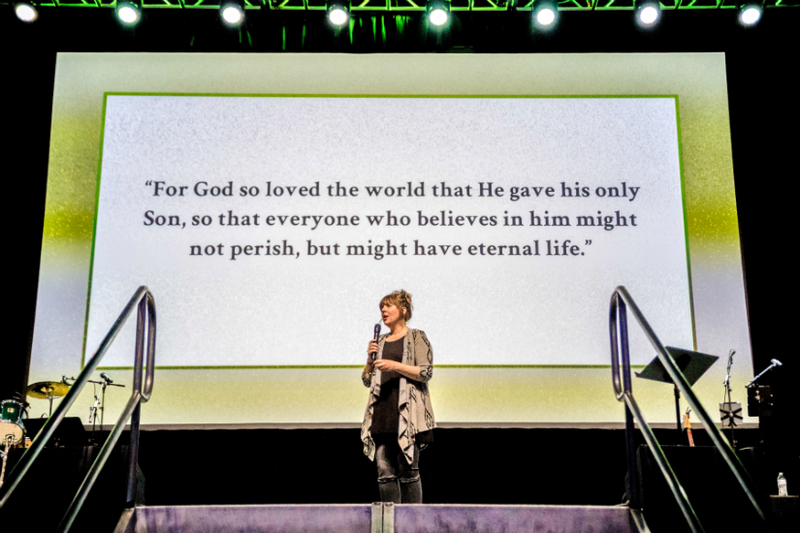 REAP Team chastity educator Rachel Leininger gave the Saturday night keynote at SteubySTL Week 1, sharing her experience of the cross of Christ after a miscarriage. Leininger has spoken at Steubenville conferences throughout the country. Steubenville STL Mid-America is hosted annually by the archdiocese in Springfield, Mo. Rachel Leininger, chastity educator for the REAP Team, gave the evening keynote "The Cross Revealed." Leininger described her suffering after a miscarriage, exhorting the crowd to not lose faith in times of difficulty. "The central tenet of our faith is that the worst thing happened to the best person," she said. "It's not wasted: not one second of my suffering, not one second of His, not one second of yours." Leininger's talk led into the conference's climactic adoration, during which Father Pivonka walked the Blessed Sacrament through the stands. Led by seminarians bearing candles and incense, the procession lasted an hour as Father Pivonka blessed each section. Light from the spotlights gleamed off the monstrance, flashing gold across the arena. "It's just so peaceful," Gus Heithaus of Sacred Heart Parish in Florissant said about adoration. Returning the sacrament to the altar on the main stage, Father Pivonka led the crowd into silent prayer before benediction. The next morning, author and chastity speaker Jason Evert gave the closing keynote talk, urging participants to develop regular habits of prayer. He gave advice on growing a prayer life, highlighting contemplation and reception of the sacraments. "The key is consistency," he said. Speakers from throughout the weekend then led the crowd in prayer before Mass to "prepare for the greatest event on earth," as host Brian Kissinger said. The stage lights tinted red as the prayer team invoked the Holy Spirit's aid. 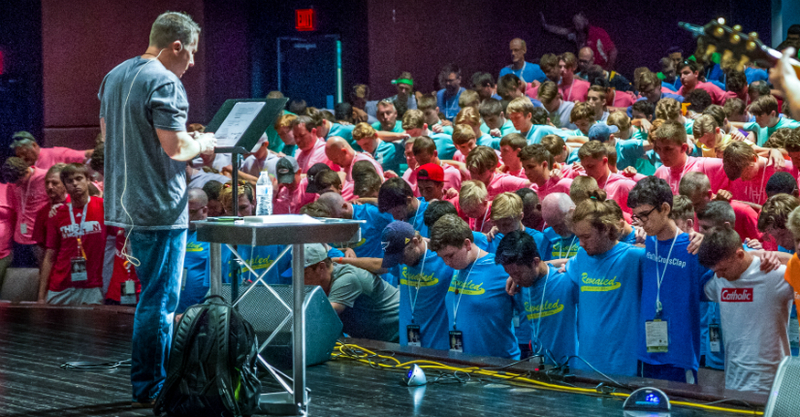 Author and theology of the body speaker Jason Evert leads the young men of SteubySTL Week 1 in prayer. Evert spoke at the first weekend of Steubenville STL Mid-America, hosted annually by the archdiocese in Springfield, Mo. Per Steubenville tradition, after Mass Father Pivonka invited young men and women discerning priesthood or religious life to come to the stage for a blessing. Hundreds poured down both times. The young women filed into the shape of a cross between seats. The young men stood in more disarray, arms around each other. Seminarian Joseph Esserman stood at the vocations call years ago. He said that "at Steubenville, I first had a very special encounter with the Lord" and that he "saw the joy of the priesthood." Dismissing the crowd at the close, Archbishop Wells in his role as apostolic nuncio bestowed a papal blessing as attendees prepared to head into the world.